Now in its 13th year, New England's largest and most prestigious festival — the Rhode Island International Film Festival™ (RIIFF) — will take place August 4-9, 2009. Ranked as a one of the Top 12 Film Festivals in the United States, this world-class event will be held at venues around Providence. It features screenings, filmmaking workshops, meet-and-greet industry events and seminars. Aiming to promote Rhode Island as a filmmaking location and to celebrate the independent filmmaking spirit, RIIFF also hosts a number of high-profile premières and provides a showcase for international features, documentaries, and shorts. Founded in 1997, the Rhode Island International Film Festival has quickly carved out a name for itself. It accepts films of any type, in any genre and will screen this year 235 international productions. The films were shot and produced in 54 countries. Rhode Island native Bobby Farrelly was so impressed with the festival's debut that he held the world premiere of his next film - There's Something About Mary - at the 1998 event. This year, RIIFF will screen amazing new work selected from over 3,300 film submissions. 100% of the RIIFF schedule is created from these film submissions; and not culled from other festivals. This makes for a truly dynamic event where regional audiences discover new work and new filmmakers whose work often overlooked. The Rhode Island International Film Festival is where the voices of Independent Film are heard and stars are born. 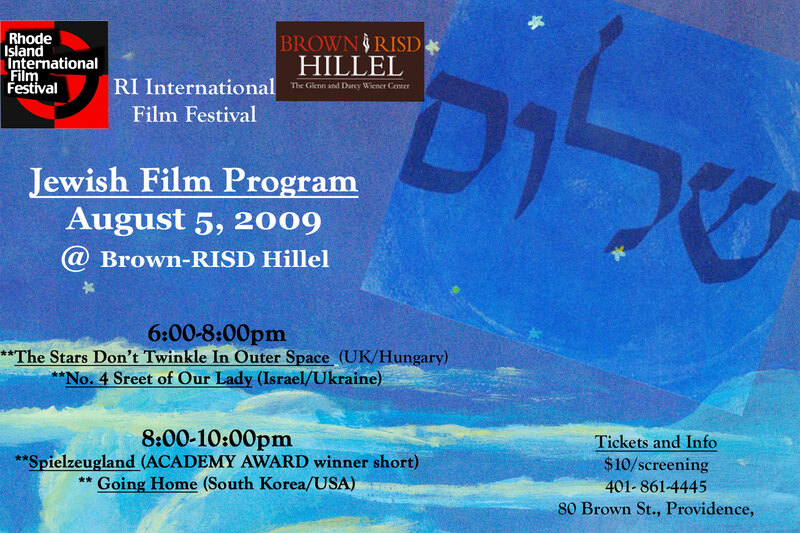 The festival weeks launches with its Opening Night Celebration on Tuesday, August 4th, 2009! Come and experience a dazzling selection of unique films from across the globe. To learn more, please click here..
• Thursday, August 6th: A special Festival Premiere screening of David Bettencourt and G. Wayne Miller's "On the Lake: Life and Love in a Distant Place" with a preview of their new work-in-progress: "Behind the Hedgerow." The screening will be followed by the critically acclaimed "William Shatner's Gonzo Ballet." Both films will be presented in a collaboration with the Rhode Island Council for the Humanities (RICH) and Rhode Island College. • Friday, August 7th: Lifetime Achievement Award to actor Ernest Borgnine and premiere screening of his latest film "Another Harvest Moon," post screening party at the Federal Reserve in Providence. Retrospective of his career in film to be held during the month of August throughout the state of Rhode Island. "Another Harvest Moon" marks Mr. Borgnine’s 199th feature length film in addition to his remarkable run on television. He is also a remarkable 92 years young! • Saturday, August 8th: Roger Williams Independent Voice Award presentation to Wat Misaka and screening of the documentary “TRANSCENDING: The Wat Misaka Story,” that chronicles his barrier-breaking career. Presented in collaboration with Sport in Society. • Exciting partnerships, screenings and events with the International Institute of Rhode Island, the Gloria Gemma Breast Cancer Resource Foundation, the Rhode Island Council for the Humanities, Rhode Island College, Sport in Society, the Armenian Historical Association of Rhode Island, Dreamworks Animation and National Amusements/Showcase Cinemas. The Rhode Island International Film Festival is proud to showcase the amazing work that is being produced in our small state! A tour of film and media production studios will be held on Saturday, August 8th at 11am to 2:00pm. On the tour you will visit studios that are located in the surrounding area of Providence. You will have the opportunity to meet and talk to the designers, artists, and filmmakers of these studios. Welcoming remarks will be given by the Director of the RI Film & TV Offices, Steven Feinberg. The tour is FREE to filmmakers with a pass and open to guests for the price of $20. There is only a limited amount of space so sign up early by calling our office at 401.861.4445. The modern, 21st Century filmmaker must be both an auteur and an entrepreneur – hence the rise of the “auteurpreneur,” a term coined to describe the emerging role that a filmmaker must play. Digital distribution and other dynamic technologies provide filmmakers with an array of powerful tools to use to promote and market their artistic vision. Don't miss "HIP, HOT AND SHORT: SALUTING THE ART OF THE SHORT FILM" the Official 2009 Closing Night Presentation. It will be an amazing evening of short films from around the world, plus the premiere screening of Megastar Productions' Inc. new documentary, “The Impact of Your Choice: Breast Health Awareness, When Is Too Young?” The film was produced by Deborah Hoch.